I’ve been ordering spaghetti at Pancake House for as long as I can remember. My mom introduced me to their spaghetti when I was five years old and my favorite spaghetti house closed down. I never quite got to order much of the other items from the menu since. Sure I got to try their Hot Roast Chicken, their Tacos which is an all-time favorite, and Pan chicken and I like them too but I always go back to spaghetti. Looking for something to write about, I decided to try an item in the menu that I haven’t tried yet when we visited their branch in Bonifacio High Street a few days ago. I asked my husband if he could do the same and he happily agreed. Being a heavy rice-eater, Jay decided to order the Spicy Chicken Fillet with Brown Rice Pilaf. A pilaf is a middle-eastern rice dish mixed with vegetables and several different spices. The dish was definitely spicy and I was surprised that Jay liked it so much. I’m usually the one who goes gaga over spicy foods. 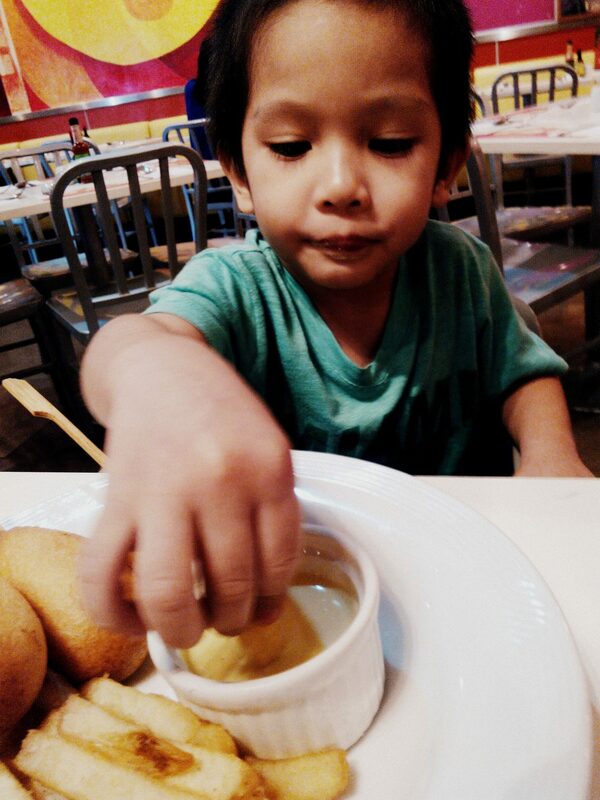 I ordered Spanish Omelette, Pablo decided on Mac n’ Cheese with a brown waffle on the side, Lukas got the Classic Pancakes with Candy-Coated Choco Bites and Judah pointed to the picture of Corn Dogs and Fries. My Spanish Omelette was okay. As Joey Tribbiani would probably say it, “what’s not to like? Egg– good, onions — good, tomatoes — gooooooodddd, capsicums– good!” But it really isn’t something to rave about. It’s not bad, but it wasn’t to die for either. Jay, on the other hand, loved his Pilaf so much, he already planned to go back and order the same dish on Valentine’s day, hah! I tried it and it was really good. But you need to love spicy food because both the chicken and the rice were spicy. How spicy? Hmmm…as spicy as Tostitos medium salsa. The paillaf had the right amount of tender and it goes well with the rice. The problem with it if you’re not a spicy food lover is that there’s nothing in the dish to balance it, the garlic cream sauce doesn’t really help. But it was delish, not bad for a Php 186 dish. Much as I liked what was on my plate, I secretly wished I ordered Pilaf instead. How about the Kids’ food? I looked over my kids to see if they’re enjoying their dinner. Lukas finished off the chocolate bits but barely touched the Pancakes and was asking Jay if he could get spaghetti. Pablo finished off his waffle and was pretending to like his Mac n’ Cheese. He’s not really fond of pastas and I knew this was going to happen, but at least he’s trying. He knew that he had to eat what he ordered. I reached over to taste both their food and Jay and I agreed that the Mac n’ Cheese was better than the usual Mac n’ Cheese other restos serve. I’m not really into pancakes but I noticed that it felt fluffy in my mouth which, if I base it on Master Chef U.S.A., is just the way it should be. The kids exchanged plates eventually and Pablo finished off the pancakes. Lukas tasted a little of the Mac n’ Cheese but didn’t like it all that much. He really wanted spaghetti. Judah seemed to be the only one who was really enjoying his food among the three. Jay and I were able to eat our dinner without much trouble because Judah was eating on his own. The western dip that came with the corn dogs and fries was a hit! The ”Corn Dog and Fries” was priced at Php 153 which includes a glass of Minute Maid pulpy orange juice. The ranch dressing was a hit! 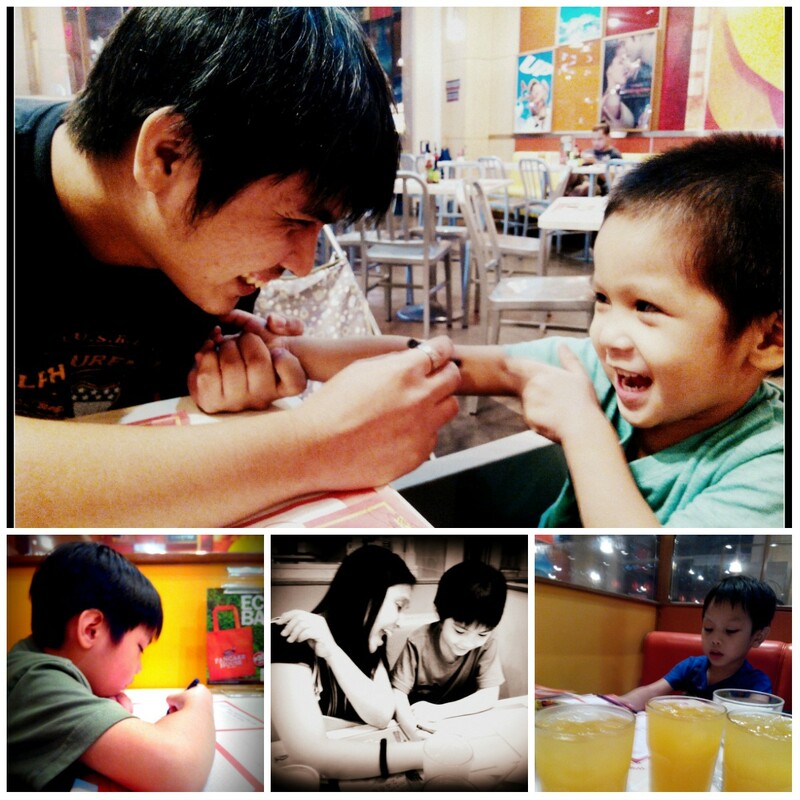 Pancake House is unmistakably a family place. They handed the boys a storybook-type menu with the title, The Diary of a Happy Kid printed on the cover the minute we settled down. They were also given a cup filled with crayons and activity sheets that kept them busy. 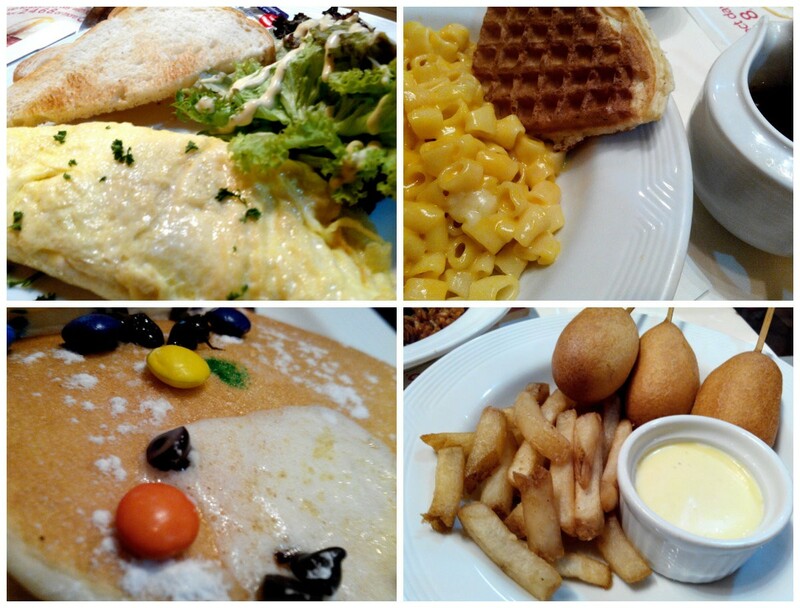 Pancake House is unmistakably a family restaurant where kids are very much welcome! It works extremely well for a family like ours. First of all, when we walk into any Pancake House branch, we don’t get worried about people eyeing us and complaining about the racket our kids create during our visit since the place makes it clear that kids are welcome. I don’t know about dining there on Valentine’s day, but so far, Pancake House hasn’t disappointed us yet so they’ll still be seeing a lot of us in the future, but maybe not on Valentine’s day. And if we do come back some other day, let me just be straight with you, I’m absolutely, without any doubt, ordering my favorite spaghetti. Wow, may! That looks really delish! We’ll try that real soon!!! Hi May, when we went for a vacation there last year I too my family (including my sisters) at Pancake House for breakfast and my sister ordered the same, Spicy chicken fillet with brown rice pilaf, I was like, “What is that for breakfast?” but she let me tried it and it tasted delicious. Can’t wait to eat there again when we come back! Wow! Makes me want to go to Pancake house soon! Our favorite branch is the one at Eastwood…will ask if they serve it there. 😀 thanks for sharing this! 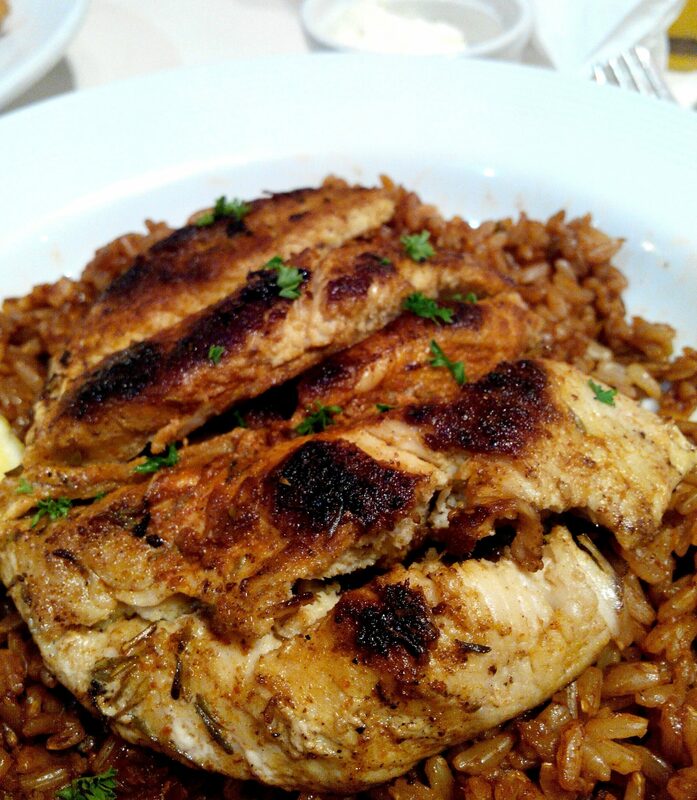 I like spicy food and and their chicken and rice pilaf resembles what we always have at Mexicali. I’m eyeing the Mac n Cheese too. I love Pancake House! There’s just something comforting about it! My classic orders are the Pan Chicken and Clubhouse while its the Almondigas Soup for my little almost 2 year old son. Your post makes me want to try this Spicy Chicken Fillet though! Hopefully soon!